trio42 is a Dutch chamber music ensemble. In the unique combination of harp, violin and saxophone, the three young and talented musicians Merel Vercammen, Anneleen Schuitemaker and Juan Manuel Domínguez give a refreshing boost to chamber music with passion, joy and exciting interaction. The three musicians, winners of major (inter)national awards as soloists, have found each other in a quest for repertoire for this unknown but surprisingly beautiful combination. Their enthusiastic presentation has made their performances accessible for a broad audience. They play at many venues and festivals such as the International Chamber Music Festival of star violinist Janine Jansen, the NJO Music Summer and the Zeist Music Days. 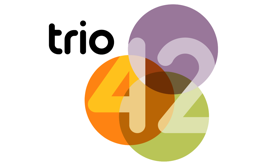 Because no original works have been written yet for this combination, the members of trio42 search for and arrange all the music themselves. Because of that, they develop an even closer engagement in everything they play. This is one of the foundations of their unique sound and musical interaction. Moreover, the audience will be surprised by something they have never heard before! 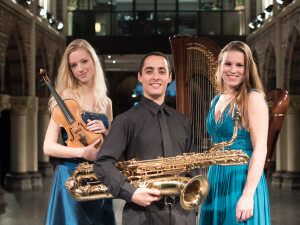 trio42 was co-founded by saxophonist Christiaan van der Weij, member from 2008 till 2014, and harpist Remy van Kesteren, member from 2008 till 2015. Dutch harpist Anneleen Schuitemaker (1992) recently won an academy place at the prestigious Berlin Staatskapelle. 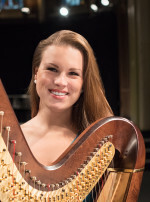 First Prize winner of several competitions (Rosa Spier Harp Competition, International Harp Competition Germany), she is currently finishing her Master studies at the Amsterdam Conservatory with Erika Waardenburg. Anneleen appeared as a soloist with several orchestras, performing concertos by Boieldieu, Bosveld, Ditters von Dittersdorf, Händel en Mozart. 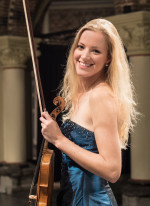 Merel Vercammen (1988) is a First Prize winner of the National Competition of the Dutch Foundation for Young Musical Talent, where she was awarded a special prize for the best performance of a Dutch work as well. She was also a prize winner of the London Grand Prize Virtuoso Competition. Merel recently graduated from the Royal College of Music in London with highest distinction. She has appeared as a soloist with several orchestras (a.o. with the Nijmeegs Studentenorkest in Brahms' violin concerto). She received master classes from Emmy Verhey, Phillipe Graffin, Valery Oistrakh, Liviu Prunaru, Yayoi Toda, Josef Rissin, Lewis Kaplan, Daniel Hope, Ilya Grubert and Zakhar Bron. In 2013 she made her debut at the prestigious Wigmore Hall. Juan Manuel Dominguez (1985) was born in Buenos Aires Argentina and began his musical studies in piano and saxophone when he was 6 years old. At the age of 13, he became a student of the Colegio Ward Conservatory of Music where he graduated in 2004, and then he studied at the National Music Conservatory of Buenos Aires “Carlos López Buchardo” with the profesor Emiliano Barri where he graduated as a Bachellor in Musical Arts specialized in Saxophone in 2007. With the Argentinian 4Mil Saxophone Quartet he won the first price of the two most important chamber music prizes of Argentina: the Bienal Juvenil competition and the Música en Plural competition. In 2008 he moved to the Netherlands to study with the international soloist Arno Bornkamp at the Conservatorium van Amsterdam where he got both his Bachelor on 2011 and his Master of Music degree in 2013. 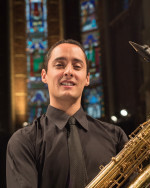 He has specialized in baritone saxophone and he is a member of several ensembles such as: Aurelia Saxophone Quartet, Keuris Quartet and Duo Ormaza.